The state-of-the-art Computer Assisted Rehabilitation Environment (CAREN) system has been successfully installed at the new Defence and National Rehabilitation Centre (DNRC) at Stanford Hall near Loughborough. 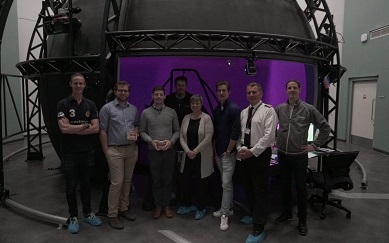 The High End CAREN system is the world’s most advanced biomechanics lab incorporating a 360 degree Virtual Reality environment, and is the first of its kind in Europe. It will be used in the rehabilitation and therapy of military veterans and active soldiers for a wide range of conditions, including brain and spinal injuries, neurological disorders and amputees. Virtual reality technology is becoming increasingly more common in rehabilitation, as it transports patients far beyond the four walls of the gym and engages them with new and exciting training programmes. Patients could walk through a relaxing forest on a path which winds from left to right, and up and down, while learning to walk again. Or they could explore a cityscape, with all the real-life challenges you would typically counter. Throughout these environments patients are safely supported by a safety support harness, so patients can challenge themselves without fear of falling or hurting themselves. The CAREN was developed by Motek in The Netherlands and is supplied in the UK by Summit Medical and Scientific. The Virtual Reality dome immerses patients in a huge variety of situations and games. A dual-belt treadmill allows patients to stand or move within the virtual world and integrated force plates measure the forces being generated through the body. The treadmill is mounted on a motion base like those used with flight simulators. This means that the treadmill can now move freely within three-dimensional space. Infra-red motion capture cameras will precisely record the patient’s movements via markers placed on the body. High speed video allows for playback of each patient session within detailed reports. The data is collected in easy-to-use software to provide measurement, analysis and feedback for the patient in real time. The system’s support harness means that patients can start training early and confidently, even wheelchair users, in a safe environment. Therapists can adjust the patient’s gait, monitor the immediate effects, and generate reports, all with just a few easy clicks. The system revolutionises real time gait analysis and training, while allowing for additional therapy such as dual task and cognitive training as well as numerous research opportunities. The DNRC was gifted to the nation on June 21st, read more here. If you would like to find out more about Summit Medical and Scientific and our products, please follow us on Facebook, Twitter and LinkedIn. You are also welcome to contact Sara Brammall, our Managing Director, via email: sara.brammall@summitmedsci.co.uk. Motek are the global leader in virtual reality and robotics research and rehabilitation, combining almost 20 years of experience in high-level technologies. Motek excel in building the most versatile devices, integrating latest technologies and ensuring real-time data collection. Their support package empowers every stage of your research on human movement. Read more.